I will continue to send the comex data down to my good friends at the Doctorsilvers website on a continual basis. They provide the comex data. I also provide other pertinent data that may interest you. So if you wish you can view that part on my website. The gold comex today had a poor delivery day, registering 0 notices served for nil oz. Silver comex registered 115 notices for 575,000 oz. A few months ago the comex had 303 tonnes of total gold. Today the total inventory rests at 245.83 tonnes for a loss of 57 tonnes over that period. In silver, the open interest fell by a tiny 175 contracts with yesterday’s rise in price of $0.05. Looks like some of the shorts are vacating the arena as they are scared at what they are witnessing. For the past year, we have been witnessing massive liquidation of contracts despite the fact that it cost nothing to roll. This makes no sense and it smacks of cash settlements which are totally illegal. Since I have been following comex data, I have never witnessed such a massive liquidation in both gold and silver. The total silver OI still remains relatively high with today’s reading at 148,020 contracts. The big December silver OI contract fell by 58 contracts down to 517 contracts. In gold we had a fall in OI with the fall in price of gold yesterday to the tune of $2.60. The total comex gold OI rests tonight at 372,720 for a loss of 2,603 contracts. The December gold OI rests tonight at 1054 contracts losing 23 contracts. the bankers certainly wanted gold under suppression today. By midnight, gold was down to $1228.00. By London’s first fix it was already down to $1224.00 and then proceeded to head southbound. At 4 am it hit $1218.00. Then gold saw some action as it swiftly rebounded to $1222 by 8;20 am (comex opening). By London’s second fix it was back down again to 1216.10 only to rebound again to $1230.30 by 12:30 as London as already put to bed. It finished the comex session at $1225.10 and the access market at $1227.00. Silver had a similar roller coaster ride. The bankers had trouble suppressing silver in the Asian time zone. By midnight silver remained at $17.15. By London’s first fix at 3 am it registered $17.06. Then the bankers hit silver hard as it was propelled southbound to $16.95 by 4:30 am est. It then rebounded in sympathy with gold back up to $17.04 by comex opening time and it remained there as the 10 am (2nd London fix) also came in at $17.04. Silver continued its northbound journey for the day hitting its peak at 12 noon at $17.19 as London was finally put to bed. It finished the comex session at $17.06 and the access closing price came in at $17.08. Let’s head immediately to see the major data points for today. some rates moved closer to the positive and some remained constant and they are out of backwardation!! Now, all the months of GOFO rates( one, two, three six and 12 month GOFO moved positive . They must have found a few bars to lease. On the 22nd of September the LBMA stated that they will not publish GOFO rates. However today we still received today’s GOFO rates. It looks to me like these rates even though negative are still fully manipulated. London good delivery bars are still quite scarce. The backwardation in gold is incompatible with the raid on gold. It does not make any economic sense. The total gold comex open interest fell today by 2,603 contracts from 375,323 all the way down to 372,720 with gold down by $2.60 yesterday (at the comex close). We are now into the big December contract month where the number of OI standing for the gold metal registers 1054 contracts for a loss of 23 contracts. We had 1 delivery notice served yesterday so we lost 22 contracts or 2200 oz of gold will not stand for the December contract month. The non active January contract month fell by 51 contracts down to 503. The next big delivery month is February and here the OI fell to 233,726 contracts for a loss of 3,341 contracts. The estimated volume today was poor at 82,580. The confirmed volume yesterday was fair at 152,140 even with the help of high frequency traders. The comex now has no credibility and many investors have vanished from this crooked casino. Today we had 0 notices filed for nil oz . Several weeks ago we had total gold inventory of 303 tonnes, so during this short time period 57 tonnes have been net transferred out. We will be watching this closely! This initiates the month of December for gold. ii) Into Delaware; 8,046.000 oz ???? Total of all silver inventory (dealer and customer) 176.939 million oz. The total number of notices filed today is represented by 115 contracts or 575,000 oz. To calculate the number of silver ounces that will stand for delivery in December, we take the total number of notices filed for the month (2678) x 5,000 oz to which we add the difference between the total OI for the front month of December (517) minus (the number of notices filed today (115) x 5,000 oz = the total number of silver oz standing so far in November. Thus: 2678 contracts x 5000 oz + (517) OI for the November contract month – 115 (the number of notices filed today) =15,400,000 oz of silver that will stand for delivery in December. we gained 70,000 oz that will stand for the December silver contract. 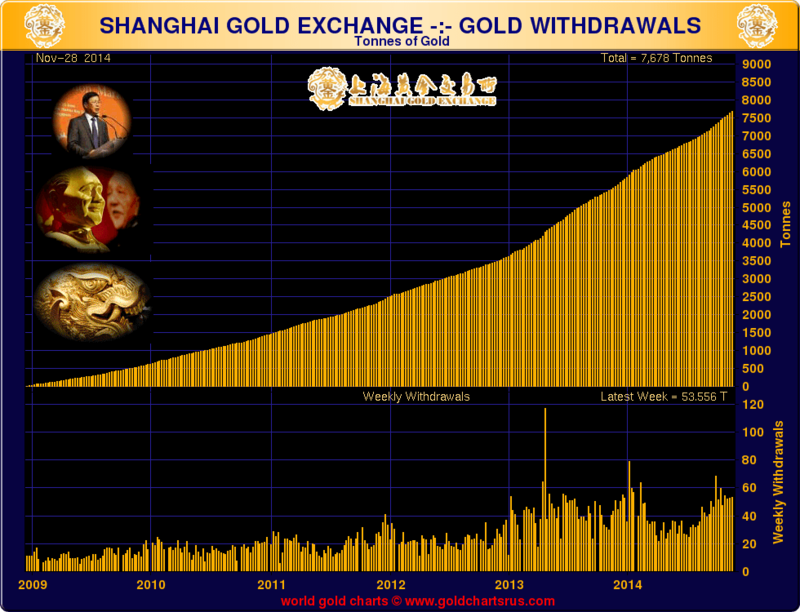 dec 10.2014: we gained another 2.99 tonnes of gold at the GLD. If China cannot get its gold from London, then its only source will be the FRBNY. dec 3. we lost 2.73 million oz of silver/inventory 347.427 million oz and back where we were on Dec 1.2014.
dec 2 wow@!! @ a huge addition of 2.20 million oz of silver/inventory 350.158 million oz. 1. Central Fund of Canada: traded at Negative 10.9% percent to NAV in usa funds and Negative 10.9% to NAV for Cdn funds!!!!!!! Note: Sprott silver trust back hugely into positive territory at 0.26%. Respected economic historian and author of the “Gloom, Boom and Doom Report,” Dr Marc Faber has warned about the continuing and coming decline of western economic power. He believes that the generation of young people starting to work today will be the first in two hundred years to have a lower standard of living than their parents had. He believes dividend paying Asian stocks will grow wealth in the coming years and remains an advocate of owning physical gold. Faber has consistently warned since the late 1990’s that this dynamic would come to pass as the West and the U.S. in particular exported its industrial infrastructure and binged on consumer junk fuelled by easy credit while the emerging economies of east Asia used the proceeds to focus on production rather than consumption to become industrial powerhouses. He highlighted certain factors that are leading to this lower standard of living for young western people. Banks now generally charge more to hold one’s money than the interest they pay out. He cites the yields on Swiss ten year bonds at 0.46% as an example of how people, and especially young people, are disadvantaged relative to previous generations. Agricultural commodities including palm oil and Asian companies processing agricultural produce is where Dr. Faber currently sees value. Some of these companies in Malaysia and India, for example, pay dividends between 2% and 4%. The young people who invest in these types of company will see their wealth steadily rise as opposed to their western counterparts who rely on the casino of rising paper asset prices. 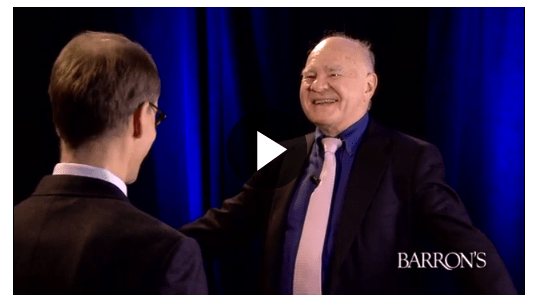 Dr. Faber is a long time proponent of owning physical gold. He has consistently urged people to act as their own central bank in acquiring bullion coins and bars as financial security and he believes that storing gold in Singapore is the safest way to own gold today. 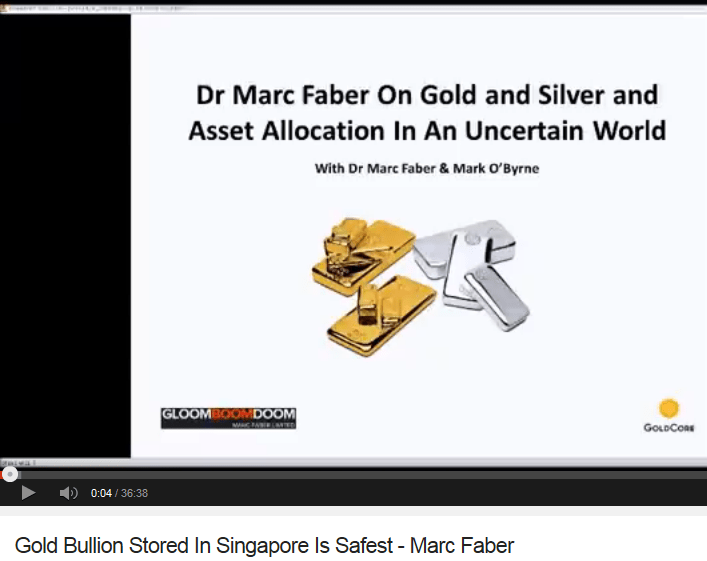 Dr Faber has said that in the long term, he thinks gold could rise to over $10,000 per ounce. 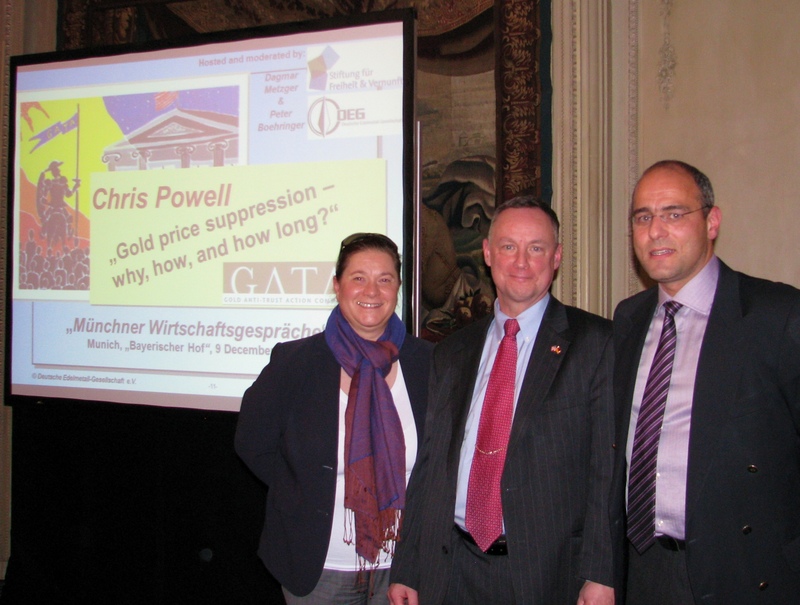 More importantly, he continues to emphasise the importance of owning physical gold as part of a diversified portfolio in order to protect against a coming stock market correction and the possibility of another global financial crisis and crash. Today’s AM fix was USD 1,219.50, EUR 980.94 and GBP 778.24 per ounce. Yesterday’s AM fix was USD 1,228.25, EUR 991.88 and GBP 783.82 per ounce. Spot gold fell $2.20 or 0.18% to $1,227.40 per ounce yesterday and silver climbed $0.04 or 0.24% to $17.08 per ounce. Gold in Singapore ticked marginally lower and this trend continued in London. Gold is down from Wednesday’s seven-week high as the dollar and European shares firmed, leading to a decline in a safe haven bid for gold. The precious metal is still on track for a 2.6% weekly gain so far, its strongest since mid-October, as safe haven demand and short covering have given support. Gold remains just below its highest in more than six weeks as investors weighed the possibility of deflation contributed to by falling energy prices against signs of rising demand. Chinese demand saw volumes on the Shanghai Gold Exchange (SGE) for gold of 99.99% purity rise for a second day yesterday to 28,152 kilograms. This is the highest since November 18 in the world’s biggest gold buyer. An improvement in sentiment was seen in the holdings of SPDR Gold Trust, the world’s largest gold exchange-traded fund. The fund saw inflows of nearly 3 tonnes on Wednesday, bringing total holdings to 724.80 tonnes. Silver continues to consolidate above $17 per ounce, while platinum rose 0.4 % to $1,238.25 an ounce and palladium gained 0.5% to $814.70 an ounce – the highest level since September. Thanks to all GATA supporters who helped make this expedition possible. Some blows were struck against the bad guys. First it was humans. Now it is vacuum tubes. — have found evidence that Barclays and Deutsche Bank may have used algorithms on their trading platforms to manipulate foreign-exchange rates, a person with knowledge of the investigation said. Transparency?? by the Bank of England?? Of course not for records of the bank’s gold transactions and those of its “customers.” What puffery! Mark Carney, Bank of England governor, swept aside much of the secrecy that traditionally surrounds the central bank’s deliberations on Thursday, promising to publish voting details and minutes of interest rate decisions at the same time they are announced. And now Bill Holter with another fine commentary..
Why don’t you listen to them? …revisited. A few weeks back I wrote a piece titled “why don’t you listen to them?”. The subjects were Paul Craig Roberts and David Stockman because both were previously employed at top level positions in Washington and are both are trying to warn a sleeping American population as to what is really coming. At the time, I thought is was important to highlight their on target logic exactly BECAUSE they were from inside of Washington. I’d like to do the same type of analysis again but instead choose another individual with a very long term track record from the private sector. This past week, Bill Gross reiterated the dire warning he’s given in the recent past. Bill Gross has been dubbed “the Bond King” has had more assets under management than anyone over the last 25+ years, to say he has a little experience under his belt is putting it lightly. He has also lived and invested entirely inside the box his entire career, he may be seeing a problem with the box itself. I had planned to include Richard Russell in this missive as I have noticed his “tone” change this year, and particularly the second half. As he has in the past, he has again flip flopped this week and believes we may still have a year or more of equity reflation. Until two years ago I thought he tiptoed a little bit too much and really tried to stay out of the manipulation debate. Little by little as moves in gold and silver could only be explained by jamming volume during off hours and other tricks, Russell finally came around and called BS on all markets as manipulated. Not just markets but financial and economic reports, “bravo old man!”. It’s just been in this year’s second half where he his gloomy outlook has included the talk of “systemic collapse” and also included talk about the world going back to gold standard (again, bravo!). Now, his systemic collapse is postponed in his mind but still at the center of the table. For me, the cherry picked gem from this letter was without a doubt when Mr. Gross wrote… “Keeping private investors playing the “game” in our financial markets even though they smack of a pyramid scheme might seem like a no-brainer”. And there you have it, “our markets smack of a pyramid scheme”! Again, where have you read or heard this before? He makes mention how investors will leave the negative interest rates of Germany in favor of 12% rates in Brazil, I would ask if Brazil is any less of a Ponzi scheme than anywhere else in the world? Without a doubt, I am sure Bill Gross knows this but he does work for a mutual fund company which has a basic need for capital to stay “within the box”. By the time the words gold or silver come out of his mouth, you will know game over has arrived. I wanted to mention Bill Gross to you for several reasons. First, he is at the absolute pinnacles of the finance profession and the core of the system …debt. No one has managed more money nor been closer to the debt market internals than he has. I believe he sees the game coming to a head and wants to be “on the record” before it ends. Please understand what this man is saying about “HIS” industry, he used the word “pyramid scheme” within his thought process …the only worse word he could have used (which coincidentally starts with a P) is the word “Ponzi”! How anyone could read his thoughts and still stay “inside this financial box” is beyond me? Switching gears entirely, I want to briefly ask a few questions as usual. The Treasury Department yesterday put out a bid request for “survival fanny packs” for their bank examiner employees. What in the world do they need these for… in case they get stuck in an elevator somewhere? Of course we already knew of the firearms purchased for the various government agencies along with ammo. At first it was just 1 billion rounds but that was moved up to nearly 2 billion …in case the first billion wasn’t enough or didn’t work? We also found out yesterday that Russia, who had previously scheduled testing of their own “SWIFT” system for May, next year …will now test the system Dec. 15th! http://www.zerohedge.com/news/2014-12-09/isolated-russia-begins-testing-de-dollarization-driven-payment-system Why did they move this up 5 months? Did they also see 100 NATO (U.S.) tanks rolling across Latvia as we did yesterday? Do they see something “we the sheeple” don’t? Or do they see something only the tin foil hat society could possibly dream up? 3fOil: WTI 60.23 Brent: 63.87 /all eyes are focusing on oil prices. A drop to the mid 60′s would cause major defaults. Not quite as many fireworks overnight, in another session dominated by central banks. First it was revealed that China had injected CNY400 billion into the banking system to add liquidity as the economy slows, which is ironic because on the other hand China is also seemingly doing everything in its power to crash its nascent stock market bubble mania, following the latest news that China’s CSRC approved 12 IPOs ahead of schedule which is seen as a pre-emptive step to tighten interbank liquidity amid the recent rise in margin trading. This happened as China’s big 5 banks hiked deposit rates by 20% limit with aim to cap funds heading into stocks. Another central bank that acted overnight was Russia’s which proceeded with its 5th rate hike of the year, pushing the central rate up by 100 bps to 10.50% as expected. Elsewhere, the Bank of England wants to move to a Fed-style decision schedule and start releasing immediate minutes as Governor Mark Carney overhauls the framework set up more than 17 years ago. The Swiss National Bank predicted consumer prices will drop next year and said the risk of deflation has increased as it vowed to defend its cap on the franc even as the bank refrained from cutting interest rates. Finally Norway’s central bank cut its main interest rate for the first time in more than two years and signaled it may ease again next year as plunging oil prices threaten growth in western Europe’s biggest crude exporter. All in all, a busy day for central-planners everywhere. And while crude is attempting its latest feeble rebound, both the 10 Year and the 30 Year yields are sliding, with the former now down to under 2.15%, the lowest since the October flash crash, while the 30 Year touched 2.805%, below the 2014 closing low. In Asia, the Nikkei 225 (-0.89%) traded in negative territory throughout the session albeit now off its worst levels as JPY lost some ground against USD. Hang Seng (-0.9%) was led by weakness in energy stocks while the Shanghai Comp (-0.4%) fluctuated between gains and losses, as strength in airlines and shipping names mitigated declines across oil stocks. China’s PBoC said to inject CNY 400bln into banking system. In addition there were further source reports in the Asian session that China has eased bank restrictions and PBOC targets CNY 10trln loans for 2014. These measures are to quicken the pace of lending. European equity markets have been relatively mixed this morning with marginal outperformance observed in the IBEX and FTSE MIB following the release of the ECB’s TLTRO, however the FTSE 100 is lagging as the resource heavy index is being weighed upon by weakness in the materials sector with the likes of Glencore, Rio Tinto, Anglo-American each down 2.3%-3.3%. In terms of today the calendar starts to pick up in the US as we await the latest retail sales, jobless claims data and business inventories. ECB allots 129.84bln in its second TLTRO resulting in a brief move higher in the DAX future of ~ 40 ticks, however, overall reaction has been muted given the number is largely in line with expectations. RUB touches fresh all time lows as the market is left with disappointed with the central banks decision to raise rates by just 100bps (Now 10.5%). Moderate strength seen in CHF as the SNB refrain from cutting interest rates leaving their 3 month LIBOR target at 0.00-0.25% and maintained the EUR/CHF floor at 1.20. Treasuries steady, curve flattening continues; 30Y yields 2.816%, trading at lowest since mid- October even as U.S. prepares to sell $13b of the debt in last of week’s coupon auctions. In FX, AUD has come under pressure this morning having broken technical support and with the USD index edging higher with gains of 0.5%, which in turn has put pressure on EUR/USD and GBP/USD over the last hour. RANsquawk sources have noted larger leveraged funds seen as general USD buyers (Unconfirmed). In addition, worth noting that overnight RBA Edwards stated that he continued to expect falls in the local currency and that there is room to cut rates if needed. Furthermore, following the Russian key rate decision (10.5% from 9.50%), the RUB weakened against the USD as some participants may have been disappointed that the Russian central bank didn’t adopted a more aggressive move. Also of note, The Norges Bank surprised the market this morning opting to cut their key interest rate by 25 bps to 1.25% which was against market consensus. In addition, the Norges Bank said that they see they key rate at present level or lower until the end of 2016. As a result of this action EUR/NOK rose above 9.000 for the first time since 2009. WTI and Crude oil futures have traded within a relatively tight range as the market awaits key tier 1 data later today. In specific news, analysts at Commerzbank cut their 2015/2016 Brent price forecast to USD 73.bbl and USD 83/bbl and cut their WTI price forecast to USD 69/bbl and USD 80/bbl. In the precious metal complex, Gold is under selling pressure as it moves inversely with the strengthening USD, with the DXY-index trading up 0.4%. Xmas is in danger of being cancelled if markets continue to behave like they have this week. Risk assets broadly sold off yesterday as oil markets tumbled following a cut in crude demand forecasts for 2015 by OPEC. Both WTI (-4.51%) and Brent (-3.89%) dropped to $60.94/bbl and $64.24/bbl respectively – the latter closing below $65 for the first time in five years. With regards to the demand forecasts, the cartel has reduced its forecast to 28.92m barrels/day in 2015 marking the lowest level since 2004. More pertinent however is that the demand forecast is also well below the 30m barrels/day output target that OPEC recently agreed to stick to in late November. Not helping the situation there was also comments from the Saudi Arabian Oil Minister Ali Al Naimi who told reporters that “why should I cut production?” and “the market will correct itself”. With all that the Energy sector (-3.08%) suffered another round of losses to lead the S&P 500 (-1.64%) lower for the third consecutive day. Energy aside all other major sector groups from Materials to Staples all finished the day in the red. Treasuries closed firmer, the 10y benchmark yield tightening 5bps to 2.164% – aided by a strong 10y Treasury auction with demand the highest since March 2013. The bid-to-cover ratio also hit 2.97, well above the 2.69 average of the last 10 auctions. Data was light, the only noticeable release being US trade data which showed a smaller than expected budget deficit print ($56.8bn vs. $64.0bn deficit expected). As we’ve discussed numerous times of late, the sell-off in energy credits has also been a notable theme for the US HY market. Looking at the recent price action, spreads across US HY energy names widened further yesterday and are now around 82bps wider this week. Spreads have widened over 210bps since the OPEC meeting in late November. The moves for the broader US HY market, although less exaggerated, are similar in terms of direction with the index some 44bps wider this week and +65bps post OPEC. Our US credit colleagues have recently updated their analysis highlighting that Brent at $55/bbl (on a sustained basis) could represent something of a distress point for US HY energy producers so we are not far off that now. These stresses are filtering through to decision making at the micro level with corporates starting to prudently manage their capex and cash flows ahead of expected further weakness. We flagged the ConocoPhillips story yesterday and several more over the past few weeks (eg. Schlumberger and Vale although the latter is more related to metals) but these stories may have more legs from here. Indeed yesterday saw US shale operators Oasis Petroleum and Goodrich Petroleum announce planned slashes to capex spending next year. We also saw BP announce that they are looking at incurring significant redundancy payments associated with overhauling operations through 2015. With consumption and government spending not exactly firing on all cylinders slashing investment is hardly going to be helpful for growth. Turning to Europe, today sees the 2nd TLTRO. A total of EUR 83bn was taken up under the first operation in September, a disappointment relative to DB’s projection for around a EUR 100bn take up and even higher market expectations elsewhere. Our guys do expect a higher take up in the second operation but the total in the first two TLTROs is likely to fall well short of the EUR 400bn total allowance (DB expect EUR ~170bn today), making the ECB’s aim of expanding the size of its balance sheet more challenging, especially as EUR270bn of long-term loans rolls off over the next two months. However a poor take up today should as a consequence increase the likelihood of a broader QE in Q1 which will include Government bonds. It continues to be an upside down world of bad news being quite good for markets a lot of the time. We should know the results around 10.15am London time. Back to markets the sentiment in Europe was also impacted by the moves in Oil but data wasn’t exactly supportive either. The Stoxx 600 pared earlier gains of as much as +0.9% to close -0.34% at the end of play. Similar declines were felt for energy names, with the component declining 1.93%. In terms of data, French industrial production came in particularly soft at -0.8% mom (vs. +0.2% expected), whilst manufacturing production didn’t fare much better – the -0.2% mom reading below market consensus. The prints perhaps underlined reasons over a new proposal from the French government yesterday aimed at kick starting growth in the economy and putting together the reforms needed to avoid EU sanctions. According to the WSJ, the package includes measures to increase shop opening hours, measures around resolving disputes over employment firings, deregulating legal trade and cutting red tape for construction. Benchmark 10y yields in France yesterday closed 0.5bps tighter at 0.961%. Elsewhere, 10y Bunds struck fresh lows at 0.681% yesterday, although it traded as low as 0.672% intraday as peripheral assets underperformed, headlined by further price moves in Greece. 10y benchmark yields in Greece widened a further 35bps whilst 3y yields closed 104bps wider at 9.122%. Greece’s 1y CDS was the notable price-mover however, widening over 700bps to 1536bps on the day. The ASE closed -1.01%. Asian markets overnight are taking the lead from the US session yesterday. The Shanghai Composite, HSCEI, Nikkei and the KOSPI are all down -0.24%, -0.94%, -0.86% and -1.49%, respectively. Oil remains a key focus for markets even though Asia on balance should remain a safer play in a falling oil environment given its position as a net importer of fuel. The weakness in DM credit is also seeing some spill over into Asian credit markets overnight. Malaysia (net exporter of Oil) has seen its 5yr CDS widen by around 13bps over the last few days whilst AA-rated China Oil credits are around 10bps wider since the end of last week. The USD continues to trade softer against major currencies whilst Crude oil is bouncing off yesterday’s intraday lows. Briefly coming back to the oil theme, there was further weakness in Venezuela yesterday as benchmark 3y yields widened a further 220bps to yield north of 44%. With the country’s budget straining under tumbling oil prices, Bloomberg reported that the upfront cost for 5y CDS jumped to 60% and implying a probability of default of 94%. The country’s reserves have dipped to their lowest levels in a decade, covering just 40% of debt due in the next five years. In terms of today the calendar starts to pick up in the US as we await the latest retail sales, jobless claims data and business inventories. With regards to retail sales, our US colleagues note that the retail control element is most relevant given its direct input into GDP and for this and they expect a +0.5% gain for the second consecutive month. In Europe we will get the final November inflation reading for Germany as well as preliminary French inflation data. Finally we get October industrial production for Italy and housing data out of Spain. Just 2 short months ago we noted S&P’s warning that Greece will default again within 15 months and following comments by Prime Minister Samaras that the market’s drop is due to fear that Syriza will win an early election and seek a Greek exit from the Euro. Pressuring parliamentarians and the public alike, he stated “the choice is simple,” warning that Greek financing needs are only covered through the end of February without further aid from the EU (but we thought they were ‘recovered’). Greek stocks have crashed further, Greek default risk has spiked, and 3Y bond yields are now well north of 10% (138bps inverted to 10Y). Greek PM Antonis Samaras says country’s financing needs covered until end-Feb, in comments to lawmakers of his party in parliament today. Greece will hold snap general elections in January if parliament fails to elect a president this month, Prime Minister Antonis Samaras said on Thursday as he called on all lawmakers to avert a national crisis by supporting his candidate for head of state. If the government wins the vote to elect a president, the country will complete a pending bailout review, seek debt relief from European partners and sign a precautionary credit line to support the country after the aid program ends, Samaras said. He said Greece’s funding needs were covered until the end of February.Responding to speculation that the government might put forward different nominees in the three presidential vote rounds, Samaras said Stavros Dimas would remain the government candidate in all three rounds. In the last 3 days, the broad Greek stock market has cratered a stunning 20%. This is the biggest 3-day drop since 1987 and all on the back of the ‘possibility’ that an anti-EU party takes over. Did we just get a glimpse of the ugly reality hiding behind the veil of status-quo-maintaining central-bank-sponsored manipulation? Olsen cut Norway’s main interest rate today by 0.25 percentage point to 1.25 percent, a move that shocked markets and sent the krone down almost 2 percent against the euro (weakest since July 2009). The decision came after almost three years of unchanged rates and marked a shift away from a policy that had sought to prevent excessive monetary easing from fueling house price growth. Even after today’s cut, the bank sees a “50-50 chance” for another rate reduction next year, Olsen said. Oil prices have plunged 44 percent from a June high, the worst decline since the financial crisis erupted in 2008. Norges Bank estimates oil investments will decline by 15 percent next year, with the risk of “spillover” effects on the rest of the economy and rising unemployment. And as Nick Cunningham via OilPrice.com, this is why… since Norway depends on the oil industry for almost a quarter of its economic output and has built an $860 billion wealth fund from its offshore revenue. New oil projects are being scrapped in Norway amid falling production and low oil prices. Long held up as the model for managing oil abundance, Norway has painstakingly sought to prevent the problems that occur with other natural resource-based economies, such as corruption, slow economic growth, currency appreciation, and subsequently, deindustrialization. Since 1990, Norway has diverted much of its oil earnings to a sovereign wealth fund, which has become the world’s largest. The money, reaching $890 billion as of June 2014, amounts to $178,000 for every Norwegian citizen. The sovereign wealth fund helps Norway avoid some of the problems associated with the “resource curse” by investing capital abroad. But more importantly, the money is set aside to be saved and invested to help the country plan for the eventual decline of oil production, with the intention of transitioning to a more diversified economy that can take oil’s place. The early cracks in Norway’s petrol-based economy are beginning to show, perhaps quicker than many predicted. Energy analysts have explored in detail how the ongoing decline in oil prices – down 40 percent since June – might affect oil exporting countries like Russia, Iran, Venezuela, and other OPEC members. But even Norway, the model for using natural resources to build a modern wealthy economy, is not immune to the price fall. Statoil, the mostly government-owned oil company, has seen its share price cut in half since July 2014. It is idling several offshore rigs as oil prices drop. Three rigs – the COSL Pioneer, Scarabeo 5, and Songa Trym – will besuspended until the middle of 2015 because of lower profitability. “These measures are necessary due to the overcapacity of rigs compared to the assignments we are prioritising. This situation is unfortunate, and we are doing what we can to minimise the extent of the suspensions,” Statoil procurement head Jon Arnt Jacobsen said in astatement. To make matters worse, costs of developing new fields have been steadily rising. “The boom is probably over. But we’re not looking at a steep decline in investment or production,” Norway’s oil minister Tord Lien told Reuters in May 2014. “The costs are rising too high and too fast. The Norwegian costs have risen a little bit more than elsewhere.” Since those comments, oil prices have tumbled. Norway may in fact see a steep decline in investment. Lower oil prices could force more than $150 billion worth of investments to be put on hold worldwide,according to an assessment by Norwegian firm Rystad Energy. Statoil is deferring a decision on investing $5.74 billion in the Snorre field, an offshore oil project in the Norwegian Sea. Also, Statoil’s Johan Castberg field, an estimated $16-$19 billion oil field in the Barents Sea, will be tabled for the time being. These costly projects won’t generate a sufficient return given today’s prices. But the oil price decline is only accelerating a trend that is already underway. Even with high oil prices Norway was facing a tougher future due to years of waning oil production. Since 2001, Norway’s oil production has fallen by almost half, from around 3.5 million barrels per day down to about 1.8 or 1.9 million bpd in 2014. The decline in investment is already pinching the labor market. Around 10,000 Norwegian oil workers have been laid off as the industry pares back spending, accounting for 10 percent of the sector’s total workforce, the Wall Street Journal reports. Oil workers arethreatening to strike unless the government steps in to stem further losses. And the way forward is murky. Despite its best efforts, Norway’s economy is overwhelmingly dependent on oil, which accounts for more than half of the country’s exports. Other export industries have struggled to develop as costs are too high – a classic symptom felt in countries suffering from the resource curse. But resuscitating the sector may be difficult. With such a high cost environment, it doesn’t make sense for many companies in Norway to invest in new projects. Spending could drop by another 18 percent next year as project economics look poor. Conversely, without investment, new production will not materialize in the coming years, leading to further deterioration for the sector as existing fields age and decline. To be sure, Norway has its almost $1 trillion sovereign wealth fund to fall back on, so it is not as if its citizenry will be thrust into poverty anytime soon. Still, Norway may need to begin building a post-oil economy sooner than it thought. The danger of stimulus-induced bubbles is starting to play out in the market for energy-company debt. Since early 2010, energy producers have raised $550 billion of new bonds and loans as the Federal Reserveheld borrowing costs near zero, according to Deutsche Bank AG. With oil prices plunging, investors are questioning the ability of some issuers to meet their debt obligations. Research firm CreditSights Inc. predicts the default rate for energy junk bonds will double to eight percent next year. The Fed’s decision to keep benchmark interest rates at record lows for six years has encouraged investors to funnel cash into speculative-grade securities to generate returns, raising concern that risks were being overlooked. A report from Moody’s Investors Service this week found that investor protections in corporate debt are at an all-time low, while average yields on junk bonds were recently lower than what investment-grade companies were paying before the credit crisis. Borrowing costs for energy companies have skyrocketed in the past six months as West Texas Intermediate crude, the U.S. benchmark, has dropped 44 percent to $60.46 a barrel since reaching this year’s peak of $107.26 in June. Yields on junk-rated energy bonds climbed to a more-than-five-year high of 9.5 percent this week from 5.7 percent in June, according to Bank of America Merrill Lynch index data. At least three energy-related borrowers, including C&J Energy Services Inc. (CJES), postponed financings this month as sentiment soured. “It’s been super cheap” for energy companies to obtain financing over the past five years, said Brian Gibbons, a senior analyst for oil and gas at CreditSights in New York. Now, companies with ratings of B or below are “virtually shut out of the market” and will have to “rely on a combination of asset sales” and their credit lines, he said. Companies rated Ba1 and lower by Moody’s and BB+ and below byStandard & Poor’s are considered speculative grade. The Fed’s three rounds of bond buying were a gift to small companies in the capital-intensive energy that needed cheap borrowing costs to thrive, according to Chris Lafakis, a senior economist at Moody’s Analytics in West Chester, Pennsylvania. Quantitative easing “has been one of the keys to the fast, breakneck pace of the growth in U.S. oil production which requires abundant capital,” Lafakis said. One of those to take advantage was Energy XXI Ltd. (EXXI), an oil and gas explorer, which has raised more than $2 billion in thebond market in the past four years. The Houston-based company’s $750 million of 9.25 percent notes, issued in December 2010, have tumbled to 64 cents on the dollar from 106.3 cents in September, according to Trace, the bond-price reporting system of the Financial Industry Regulatory Authority. They yield 27.7 percent. Energy XXI got its lenders in August to waive a potential violation of its credit agreement because its debt had risen relative to its earnings, according to a regulatory filing. In September, lenders agreed to increase the amount of leverage allowed. Greg Smith, a vice president in Energy XXI’s investor relations department, didn’t return a call seeking comment. The debt rout is one of the latest examples of a boom and bust in U.S. markets as unprecedented Fed stimulus fuels a hunt for yield. The fallout has been limited so far, yet the longer the Fed holds its benchmark lending rate near zero, the greater the risk of more consequential bubbles, according to former Fed governor Jeremy Stein. “To the extent that highly accommodative monetary policy courts risks to the economy further down the road, there is more of a live trade-off than there was at 8 percent unemployment” said Stein, now a Harvard University professor. Joblessness of 5.8 percent in November was about half a percentage point away from the Fed’s estimate of full employment, or the lowest level of labor market slack the economy can sustain before companies bid up wages. Employment in support services for oil and gas operations has surged 70 percent since the U.S. expansion began in June 2009, while oil and gas extraction payrolls have climbed 34 percent. Fed Chair Janet Yellen said in a July 2 speech in Washington that she saw “pockets of increased risk-taking,” including in the corporate debt markets. Midstates Petroleum Co. (MPO) is spending about $1.15 drilling for every dollar earned selling oil and gas. Outspending cash flowis the norm for many companies in the U.S. shale boom. The Houston-based company’s $700 million of 9.25 percent notes due in June 2021 have plummeted to 53.5 cents from 108 cents at the beginning of September, according to Trace. The debt is rated Caa1 by Moody’s and B- by S&P. Representatives of Midstates didn’t respond to phone calls and e-mails seeking comment. “The company has planned for and is poised to rapidly adapt to a changing commodity price environment,” Tony Sanchez, III, chief executive officer of Sanchez Energy, said in a statement yesterday. The Houston-based company expects to fully fund its 2015 capital program from operating cash flow and cash on hand without drawing on its revolving credit line, the statement said. Sanchez Energy has never had positive free cash flow. Michael Long, chief financial officer, didn’t return a call seeking comment. “Oil companies that have high funding costs in the Eagle Ford and the Bakken shale plays are the ones that are most exposed right now due to lower crude prices,” Gary C. Evans, chief executive officer of Magnum Hunter Resources (MHR) Corp., said in a phone interview. Magnum Hunter’s $600 million of 9.75 percent debt due in 2020 has tumbled to 84.5 cents from 109 cents in September, Trace data show. The notes are rated CCC by S&P and yield 13.9 percent. Evans said Houston-based Magnum Hunter sold almost all of its oil properties over the last year and a half and is now predominantly a gas company. “We’ve insulated ourselves,” Evans said. For other energy borrowers at risk, “the liquidity squeeze” will probably occur in March or April when banks re-calculate have much they may borrow under their credit lines based on the value of their oil reserves. Deutsche Bank analysts predicted in a Dec. 8 report that about a third of companies rated B or CCC may be unable to meet their obligations should oil prices drop to $55 a barrel. “If you keep oil prices low enough for long enough, there is a pretty good case that some of the weakest issuers in the high-yield space will run into cash-flow issues,” Oleg Melentyev, a New York-based credit strategist at Deutsche Bank, said in a telephone interview. Zee overnight stabilitee (and brief dead-cat-bounce this morning) has turned into a renewed bout of selling pressure and for the first time since July 2009, WTI has broken below the $60 level. Canada Heavy is trading $42.10 (down almst $4 today! ), its lowest since April 2009. Energy credit spreads are wider once again, now at +952bps. This morning in Europe, the euro is down , trading now well above the 1.24 level at 1.2433 as Europe reacts to deflation and announcements of massive stimulation and crumbling bourses . In Japan Abe went all in with Abenomics with another round of QE purchasing 80 trillion yen from 70 trillion on Oct 31. And now he wishes to give gift cards to poor people in order to spend. The yen continues to deteriorate like a rotten banana. This morning it continues with its downward movement settling down in Japan by 84 basis points and settling just below the 119 barrier to 118.41 yen to the dollar ( still heading towards 123). The pound is down this morning as it now trades just below the 1.57 level at 1.5679. 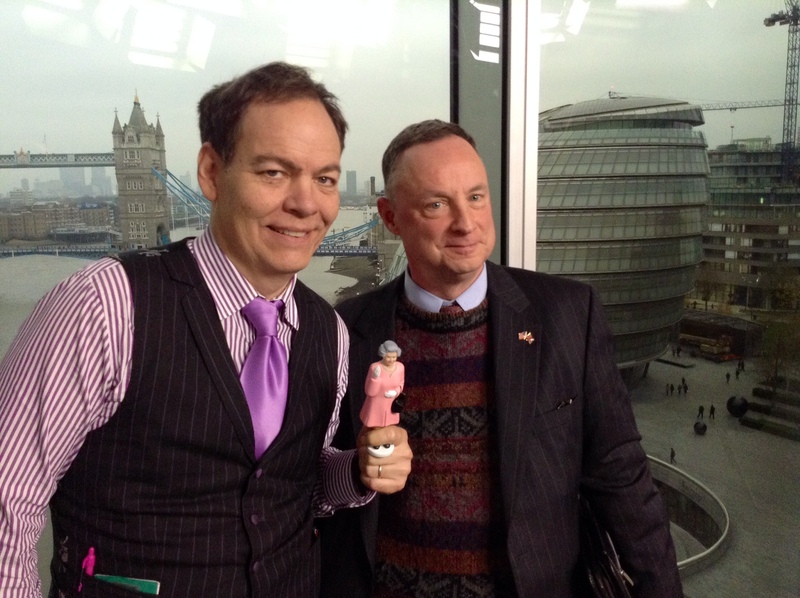 (very worried about the health of Barclays Bank and the FX/precious metals criminal investigation). The Canadian dollar is down today trading at 1.1490 to the dollar. Your closing Spanish 10 year government bond Thursday up 1 in basis points in yield from Wednesday night. Spanish 10 year bond yield: 1.88% !!!!!! The euro fell dramatically in value during the afternoon , and it is down by closing time , finishing just below the 1.24 level to 1.2385. The yen fell sharply in the morning, and again in the afternoon and by closing it was down 175 basis points on the day closing well above the 119 cross at 119.35. The British pound lost some ground during the afternoon session and it was down on the day closing at 1.5706. The Canadian dollar was well down in the afternoon and was on on the day at 1.1529 to the dollar. Currency wars at their finest today. Your closing USA dollar index: 88.68 up 41 cents from yesterday. your 10 year USA bond yield , down 1 in basis points on the day: 2.19%!!!! With America’s politicians apparently unable to agree on the Cromnibus Bill and government shutdown looming, weakness in crude oil, contagion in high-yield credit, and an extremely aggessive 30Y bond auction trumped the retail sales headlines (massively seasonally-adjusted as they were). It’s a holiday miracle: give the worst creditors access to cheap money for longer-and-longer terms and hey presto, ‘expensive’ stuff is available to everyone. Retail sales modestly beat expectations in November (+0.7% vs +0.6% expectations) despite the NRF previously reporting the worst extended Thanksgiving shopping weekend since Lehman which surely got lost in the Arima-X-12 seasonal adjustments – sending USDJPY spiking to confirm what great news this is. What was the great news? A 0.1% beat of the key ex-autos and gas category, which increased 0.6% in November, vs Expectations of 0.5%, and a decline from the upward revised 0.7% in October. The driver of all this exuberance: Vehicle sales which surged once again +1.7% MoM courtesy of an overabundance of subprime loans. Oddly, for all those prognosticators looking for windfall tax cuts from the oil price plunge, gasoline station sales dropped only 0.8% MoM, well less than expectations and not exactly the consumption-boosting exuberance every talking head proclaims. These numbers appear to be clearly in the “Fed wants to hike” narrative. Seriously?!! The 3rd largest November seasonal adjustment on record… why? and remember retail sales only beat by 0.1ppt! While we are sure this will be quietly revised away through the magic of the labor department’s statistical shenanigans (even though they note no “unusual” factors,this week saw the biggest WoW rise in continuing jobless claims since Nov 2008. While drawing any linkages to the collapse in the oil-well-permits is premature, the coincidence of the last 2 weeks seing a dramatic trend change in continuing claims is noteworthy. Is this the start of the Shale Oil industry collapse contagion spreading to the broad economy? Then again, since we are talking about some $303 trillion in US-based derivatives (at just the top 25 US holding companies alone), the bottom line is that it really doesn’t matter where the swaps are traded from: if and when these goes bad, it doesn’t matter if they are located in a FDIC-insured shell or somewhere else: the entire system will collapse all over again, unless it gets yet another multi-trillion Fed bailout. Those wishing to follow who votes for and against the Spending Bill may do so on C-Span after the jump. BREAKING: White House budget office held conference call with agencies Thursday to prepare for shutdown if funding lapses by midnight. Hours before deadline, Nancy Pelosi seizes an opportunity to kill two provisions. Dec. 11 (Bloomberg) — House Minority Leader Nancy Pelosi said Republicans lack the votes to pass a $1.1 trillion federal spending bill and urged fellow Democrats to force removal of “offensive” banking and campaign-finance provisions. Government funding expires today, and Congress must pass either the full spending plan or a stopgap bill to avoid a repeat of last year’s partial shutdown. House leaders delayed a vote, initially scheduled for about 2 p.m. today, as Speaker John Boehner sought to round up Republican support. Obama administration officials — including Health and Human Services Secretary Sylvia Mathews Burwell and Budget Director Shaun Donovan — also were calling lawmakers to urge them to vote for the measure, said a Democratic official who sought anonymity. Pelosi, in a message to fellow Democrats, said, “It is clear from this recess on the floor that the Republicans don’t have the votes” to pass the spending bill. “This increases our leverage to get two offensive provisions of the bill removed: the bank bailout and big money for campaigns provision,” said Pelosi, a California Democrat. Many Democrats oppose the bill because it includes the banking provision they call a giveaway to large institutions. A number of Republicans are against the measure because it puts off a confrontation over Obama’s immigration policy until 2015. “When you don’t fight when you have the opportunity because you’re going to find better ground, you lose the principle,” said Representative Steve King of Iowa in an interview earlier today. President Barack Obama supports the spending measure though he opposes the banking and campaign-finance provisions, said White House spokesman Josh Earnest. The bill would finance most of the government through September 2015. Democrats showed their displeasure over the banking provision by voting earlier today against a procedural measure to set rules for debating the spending bill. That passed 214-212, with 16 Republicans joining the Democrats in opposition. Representative Luis Gutierrez, an Illinois Democrat, said he opposes the spending measure because it gives bankers priority over initiatives such as the Pell Grant college-aid program. “How can you justify eliminating hundreds of millions of dollars from the Pell Grant program and then give the bankers on Wall Street an avenue in which to enrich themselves?” Gutierrez said. The campaign provision would permit a tenfold increase in donations that individuals can make to national political parties each year, to $324,000 from $32,400, according to a statement by Fred Wertheimer, president of Democracy 21. The group advocates for changes to campaign finance laws. The banking language, insisted upon by Republicans, would ease rules enacted to protect taxpayers against bank losses after souring derivatives trades helped cause the 2008 financial crisis. The dispute over the banking rule is a preview of Republican plans to roll back other business regulations when they take control of both chambers in 2015. The banking provision would let JPMorgan Chase & Co., Citigroup Inc. and other lenders keep swaps trading in units with federal backstops. A deal on the spending bill was announced Dec. 9 after Senate Democratic negotiators accepted the banking rule changes and Republican demands on other policy provisions. Republicans oppose changes to the measure and said they’re not reopening negotiations. Though Democrats aren’t pleased about the policy changes, they said they beat back dozens of other provisions that Republicans had sought, including revisions focused on environmental and labor protections. The deal puts off a confrontation over immigration until early 2015. The Department of Homeland Security, responsible for immigration policy, would be financed only through Feb. 27. Republicans want to use the agency’s spending bill to block Obama from easing deportation rules for millions of undocumented immigrants. Last year, Republican efforts to defund Obama’s health care law led to a 16-day partial government shutdown. 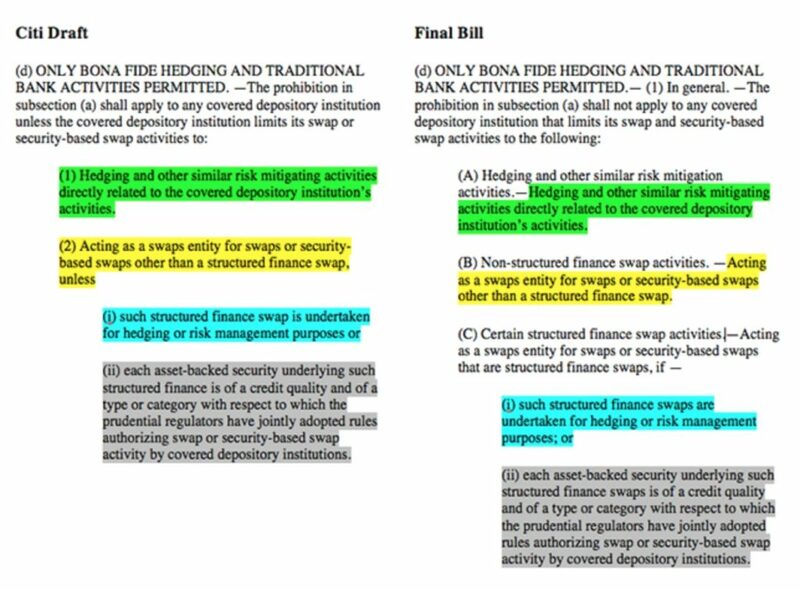 In addition to the Dodd-Frank measure on swaps trading, the funding measure would allow exceptions to clean-water laws for agricultural refuse, and block the District of Columbia from spending money to legalize marijuana following a voter-approved measure allowing possession of as much as 2 ounces for personal use. The plan would roll back safety rules on rest for truck drivers, ignoring the pleas of consumer activists and Transportation Secretary Anthony Foxx. The provision would temporarily suspend rules while a study is conducted about the number of trucks driven on congested roads. Under the change, truckers would be able to work as many as 82 hours a week. The campaign-finance language would let donors give $97,200 a year to each of three party committees for conventions, to pay for building funds and to finance the expenses for recounts and legal challenges to election results, Wertheimer said in a statement. The bill would bar the Department of Housing and Urban Development from starting a program to reduce mortgage-insurance premiums for borrowers who attend housing counseling sessions. It would stop HUD from funding increased oversight of mortgage originations by charging a new fee to lenders. The plan includes a proposal sought by the National Rifle Association that lets gun manufacturers use lead to produce ammunition, and a labor provision exempting claim adjusters from overtime requirements during major disasters. The measure would seek to shore up the Pension Benefit Guaranty Corp. by allowing some underfunded multiemployer pension plans to reduce benefits. The provision reflects an agreement by House Education and the Workforce Committee Chairman John Kline, a Minnesota Republican, and senior Democrat George Miller, a California Democrat. The measure also includes an extension until Oct. 1, 2015, of a ban on taxing Internet access. It would provide $5.4 billion in emergency funds to respond to the Ebola outbreak. The bill would require the Postal Service to continue delivering on Saturdays and to keep all post offices open. The Export-Import Bank would be allowed to continue financing overseas coal-fired power projects. As part of Obama’s effort to combat climate change, Ex-Im had revised its guidelines to bar such funding for plants that lack carbon-capture technology. Am out here to tell you all how i got my loan, I lost my husband and i was left alone on earth to take care of my child. This was already after i have spent all the money he left behind to do his funeral, After his funeral there was no much money for business and also to take very good care of myself and my kid, At this point i was confused and devastated that i had to sort for a loan from this reliable, durable and trustworthy loan firm after an advert i came across online by one Belen Drilon on how he got his loan, To also get my loan amount of $250 000.00 USD to be financially stable in every aspect of my life today. send your emails today to the following emails address: nortjeje@hotmail.com and get your loan without fail.